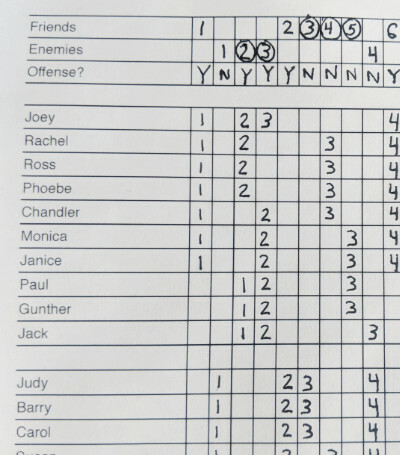 Create paper scoresheets to keep track of the score and how many points each player has played. Note: This is tested and works in Google Chrome for desktop computers. Enter the names of your players. Enter one player per line. Blank lines are allowed. Pro tip: Try putting all the O-line players together, all the D-line players together, and using a blank line to separate them. Sorting alphabetically is also helpful. It's easier to show than to explain. Here is an example of a partially completed scoresheet. In this example, I've circled the breaks. Note that this is to keep track of playtime, not stats. However, you can keep track of stats utilizing the last (blank) column. For example, if the player scores a goal, I will put a G in that column. If they cause a turnover, I will put a T there.